Introduction The Modified Physiological Triage Tool (MPTT) is a recently developed primary triage tool and in comparison with existing tools demonstrates the greatest sensitivity at predicting need for life-saving intervention (LSI) within both military and civilian populations. To improve its applicability, we proposed to increase the upper respiratory rate (RR) threshold to 24 breaths per minute (bpm) to produce the MPTT-24. Our aim was to conduct a feasibility analysis of the proposed MPTT-24, comparing its performance with the existing UK Military Sieve. Method A retrospective review of the Joint Theatre Trauma Registry (JTTR) and Trauma Audit Research Network (TARN) databases was performed for all adult (>18 years) patients presenting between 2006–2013 (JTTR) and 2014 (TARN). Patients were defined as priority one (P1) if they received one or more LSIs. Using first recorded hospital RR in isolation, sensitivity and specificity of the ≥24 bpm threshold was compared with the existing threshold (≥22 bpm) at predicting P1 status. Patients were then categorised as P1 or not-P1 by the MPTT, MPTT-24 and the UK Military Sieve. Results The MPTT and MPTT-24 outperformed existing UK methods of triage with a statistically significant (p<0.001) increase in sensitivity of between 25.5% and 29.5%. In both populations, the MPTT-24 demonstrated an absolute reduction in sensitivity with an increase in specificity when compared with the MPTT. A statistically significant difference was observed between the MPTT and MPTT-24 in the way they categorised TARN and JTTR cases as P1 (p<0.001). Conclusions When compared with the existing MPTT, the MPTT-24 allows for a more rapid triage assessment. Both continue to outperform existing methods of primary major incident triage and within the military setting, the slight increase in undertriage is offset by a reduction in overtriage. We recommend that the MPTT-24 be considered as a replacement to the existing UK Military Sieve. The Modified Physiological Triage Tool (MPTT) was derived on a military cohort using logistic regression and outperforms all existing triage tools at predicting the need for life-saving intervention in both military and civilian populations. Increasing the upper respiratory rate threshold to 24 (MPTT-24) allows for a reduction in the time required to use the triage tool. Using the Alert; responds to Verbal stimulus; responds to Painful stimulus; Unresponsive (AVPU) scale as supposed to the GCS to measure conscious level will enable the MPTT-24 to be used by a greater number of personnel, increasing its applicability. Performance of the MPTT-24 is largely unchanged from the MPTT, and it clinically and statistically outperforms the existing UK Military Sieve at predicting the need for life-saving intervention. We recommend that the MPTT-24 be considered as an alternative to the existing UK Military Sieve for the purposes of primary major incident triage in the military setting. Accepting a more pragmatic approach—with a threshold RR which is easily calculated within a shorter time frame—may change the test characteristics of the MPTT. The aim of this study was to conduct a feasibility analysis of the proposed MPTT-24 and compare its test characteristics with both the original MPTT and the existing UK Military Sieve. A retrospective review of the Joint Theatre Trauma Registry (JTTR) and Trauma Audit Research Network (TARN) databases was performed for all adult (>18 years) patients presenting between 2006–2013 (JTTR) and 2014 (TARN). 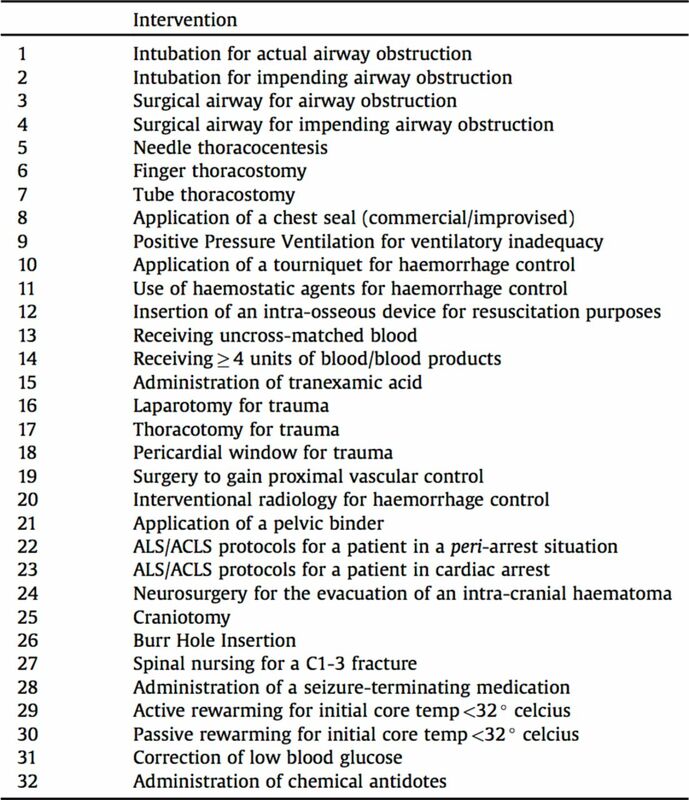 Patients were defined as priority one (P1) if they had received one or more life-saving interventions from a previously defined list, derived through international consensus of experts involved in major incident management (Figure 1).14 Using first recorded hospital RR in isolation, the sensitivity and specificity of the ≥24 breaths per minute threshold were compared with the existing threshold (≥22 breaths per minute) at predicting P1 status. Patients were then categorised as P1 or not-P1 by the MPTT, the MPTT-24 (Figure 2) and the UK Military Sieve. A McNemar test was used to determine statistical significance between the triage tools. Life-saving interventions defining the priority one patient. ACLS, advanced cardiovascular life support. 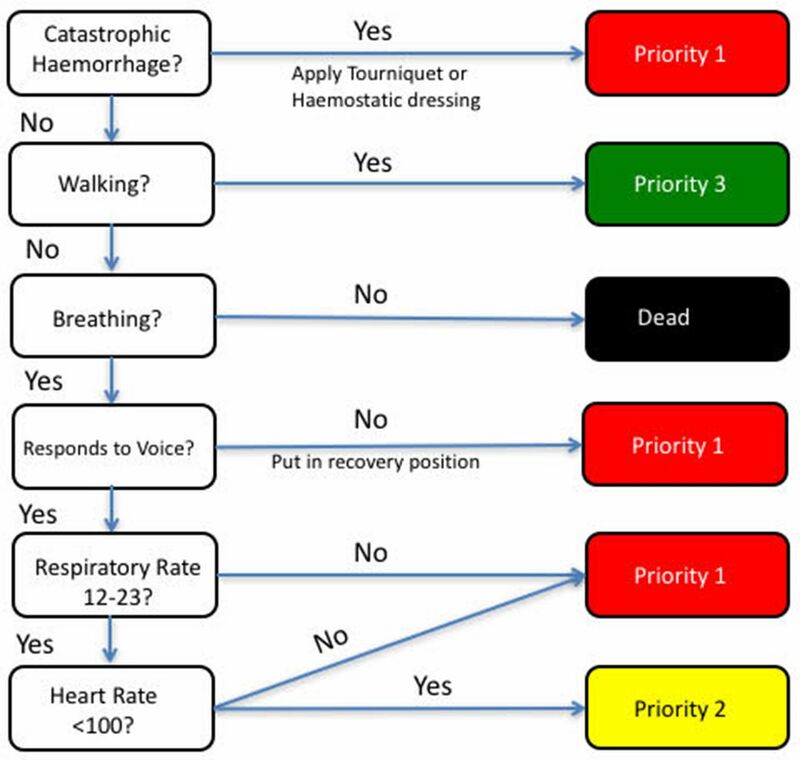 Modified Physiological Triage Tool (MPTT)-24 algorithm with increased respiratory rate upper threshold (≥24), conscious level assessment using Alert; responds to Verbal stimulus; responds to Painful stimulus; Unresponsive (AVPU scale) and the additional assessment for external catastrophic haemorrhage. Vassallo 2017. CC BY 4.0. The use of the JTTR was approved by the Medical Directorate, Royal Centre for Defence Medicine. Additionally, as part of a larger programme of work, this study received ethical approval from the Human Research Ethics Committee of the University of Cape Town, the primary academic institution of the lead author (reference 285/2013). Basic study characteristics are shown in table 1. In both populations, the increased threshold in RR in isolation was associated with an absolute reduction in sensitivity (TARN 11.4%, JTTR 13.5%) and an increase in specificity (TARN 8.9%, JTTR 13.8%). An increase in OR and positive predictive value was observed when using a higher RR for both TARN and JTTR (table 2). When incorporated into the MPTT-24, an absolute reduction in sensitivity was observed (TARN 8.9%, JTTR 3.2%) with an increase in specificity. There was a statistically significant difference between the MPTT and MPTT-24 in the way they categorised TARN and JTTR cases as P1 (p<0.001). The MPTT-24 demonstrated a statistically significant (p<0.001) increase in sensitivity (TARN 25.5%, JTTR 23.5%) over the existing UK Military Sieve in its ability to identify those in need of a life-saving intervention. In this study, we have demonstrated that pragmatic modifications to the MPTT, in the form of the MPTT-24, can be implemented while maintaining comparable performance at predicting the need for life-saving intervention in both civilian and military trauma registry populations. With these modifications, the MPTT-24 continues to outperform the existing UK Military Sieve. In keeping with the existing UK Military Sieve,2 we have included an assessment of catastrophic external haemorrhage in the MPTT-24. While experience of such injuries is likely to be limited in day-to-day civilian trauma care, we note previous European terrorist major incidents (Paris 2015 and London 2007) where the demand for tourniquets was high.15 In the context of an ongoing Marauding Terrorist Firearms Attack, the ability to provide treatment will be limited; controlling catastrophic external haemorrhage through tourniquets or haemostatic dressings may help to preserve life until the incident becomes more permissive. The MPTT assesses the patient’s conscious level using the GCS, with patients scoring 13 or lower being considered P1. While this represents the optimum threshold of conscious level at predicting need for life-saving intervention, it is not without limitations.5 Previous studies have demonstrated wide inter-rater reliability when using the GCS.8 Calculating the GCS requires familiarity and prior experience with the scale, but even then it can be time consuming. The AVPU score was designed as a rapid assessment of conscious level and is a simpler alternative to the GCS.16 17 A number of studies have looked at the correlation between GCS and AVPU with agreement that the division between being ‘alert’ and ‘responds to voice’ occurs at a median GCS of 13.9 16 18 For the purposes of simplifying the conscious level assessment in the primary triage process, we have replaced ‘GCS<14’ with ‘responds to voice’ in the MPTT-24. This pragmatic step should allow users with limited medical training to be able to use the MPTT-24 with similar results, thus increasing both its usability and applicability in the major incident setting. A key principle of primary major incident triage is that it can be conducted rapidly and measuring the respiratory rate can be time consuming. By increasing the upper respiratory rate threshold of the MPTT, users are able to measure the respiratory rate over a 15 second period, allowing for a potential reduction in the time required to prioritise patients with the MPTT-24 by up to 15 seconds. If this reduction is applied to a theoretical scenario with 20 patients requiring triage, then up to 5 min could be saved by using the MPTT-24 rather than the MPTT. However, we acknowledge that this increased threshold is unlikely to convey any additional time benefit if users choose to measure the respiratory rate over a 30 second period. Adopting the MPTT-24 comes at the expense of a reduction in sensitivity and therefore a higher rate of undertriage (1 - sensitivity). Clinically, this increased rate in undertriage is negligible; within the military setting, 30 genuine P1 patients would need to be assessed before an additional patient is undertriaged by the MPTT-24. Likewise, the reduction in overtriage (1 - positive predictive value)is negligible between the MPTT and MPTT-24 and needs even greater number of patients before a difference is observed. A key limitation of our study is the use of first recorded hospital physiology to calculate triage priorities. While prehospital data is recorded on both the JTTR and TARN databases, complete data are available for only 16.7% and 37.2% of military and civilian cases, respectively, making prioritisation with prehospital data unreliable. However, when complete hospital and prehospital physiology were compared in both datasets, we observed that the median and IQR were almost identical. When compared with the existing MPTT, the MPTT-24 allows for the potential for a more rapid triage assessment, while maintaining comparable performance and continuing to outperform existing methods used in the UK. Within a military setting, the slight increase in undertriage is offset by a reduction in overtriage. We recommend that the MPTT-24 be considered as a replacement to the existing UK Military Sieve for the purposes of primary major incident triage. Our thanks to Professor Fiona Lecky, Research Director and Antoinette Edwards, Chief Executive Officer, at the Trauma Audit and Research Network (TARN) for facilitating access to the TARN database. Advanced Life Support Group. Triage. In: Carley S , Mackway-Jones K , Major incident medical management and support. Oxford, UK: Blackwell Publishing Ltd, 2005:97–107.
. Association between the assessment of conscious level using the AVPU system and the Glasgow Coma Scale. Pre-hospital Immediate Care 2000:17–19.
. Comparison of three consciousness assessment scales in poisoned patients and recommendation of a new scale: AVPU plus. Asia Pac J Med Toxicol 2015;4:58–63. Contributors JV conceived the study and conducted the analysis supervised by JES. JV drafted the manuscript and all authors contributed substantially to its revision. JV takes the responsibility for the paper as a whole. Competing interests JV and JES are serving members of HM Armed Forces. Correction notice This article has been corrected since it was published Online First. Figure 2 has been corrected.